Pecan pie is my husband and dad's favorite dessert ever. It's my go-to recipe during the fall holidays and it's always devoured. I love pie, ya'll know I love pie. However, I also love experimenting with flavor and texture combinations. National Pecan Pie Day was this week and I wanted to see if I could recreate that gooey, nutty taste in a cookie. I came up with a soft vanilla cookie topped with smooth molasses buttercream and bourbon candied pecans. It is amazing! Today I'm giving you the recipe for the molasses buttercream and candied pecans. You can add it to your favorite sugar cookie recipe. If you are still looking for that perfect cookie recipe, run back to the blog next week for my personal favorite. 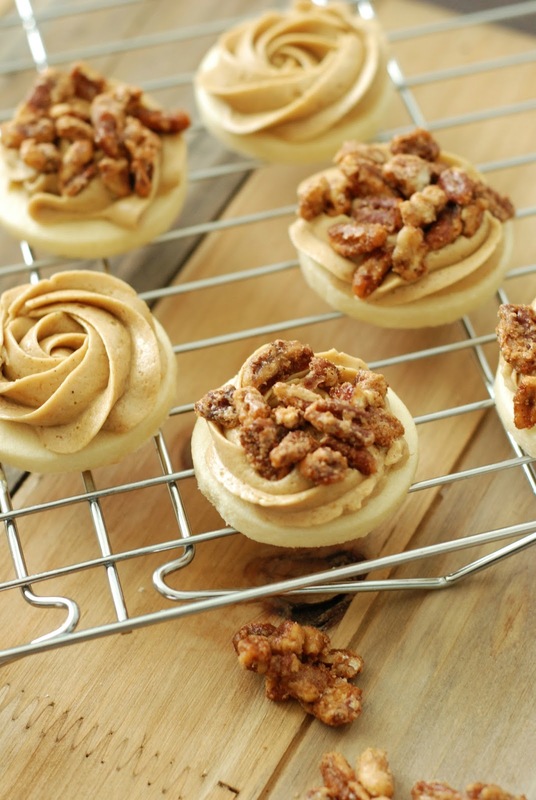 You can easily adapt this recipe for a pecan pie cupcake too! Just add the buttercream and pecans to a spice cupcake for a completely delicious dessert. 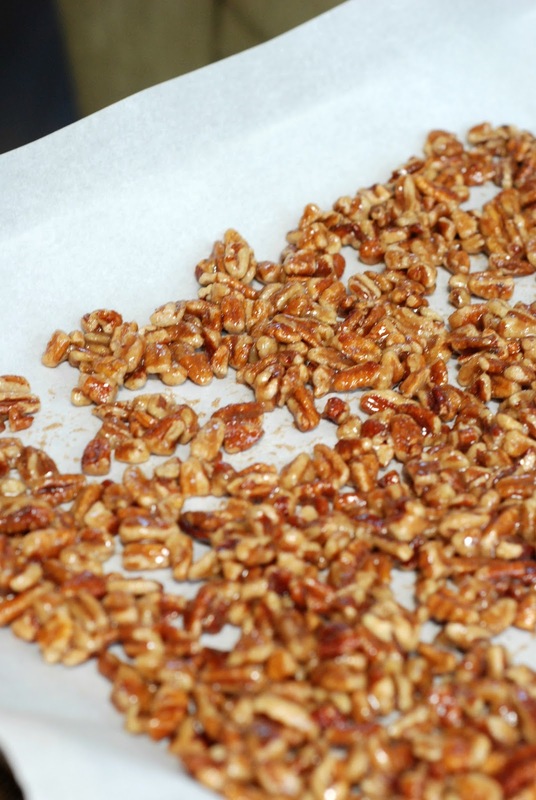 The candied pecans are baked in bourbon whiskey, sugars and some spices. In just 30 minutes you will have the most amazing nuts that are perfect on cookies, ice cream or simply as they are. They would make a yummy holiday gift too! If you are not a drinker, feel free to leave the bourbon out of the recipe. I love the complex taste it adds, but it's not necessary. I was a bit timid to try molasses in the buttercream frosting. It is such a strong flavor, but I think you will find it works amazingly well. There's only 1/8 cup included in the icing recipe - it's enough to impart the pecan pie taste, but does not overwhelm the dessert. 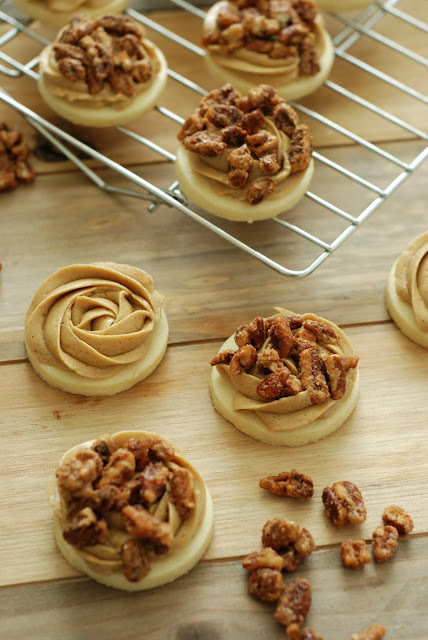 Make any sugar cookie transformed into a pecan pie dessert! Simply add molasses buttercream and bourbon candied pecans for a decadent cookie that will be a bite of autumn bliss. Preheat oven to 300 F and set aside an ungreased cookie sheet. In a medium bowl combine sugars, salt and 1/2 tbsp cinnamon. In a separate medium bowl combine pecan pieces, egg white and whiskey. Mix until pecan pieces are well coated. Add pecan pieces to the sugar mixture and stir. Lay sugared pecans in a single layer on pan and bake for 30 minutes. Shake the pan up a bit at the 15 minute mark. 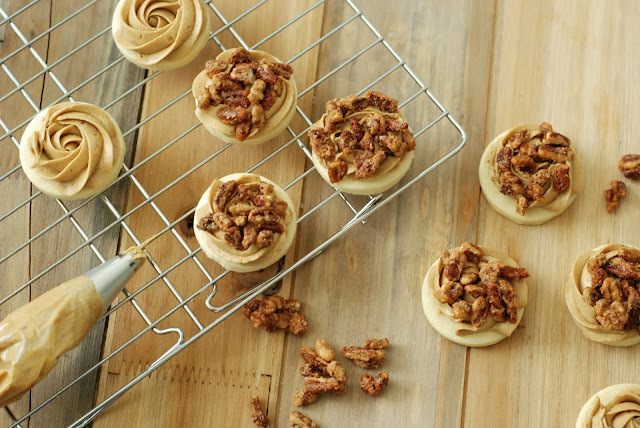 Allow pecan pieces to cool and store in an airtight container. These are incredibly delicious all on their own! To make molasses buttercream, add butter and molasses in a mixing bowl. Beat until they are well combined and slowly add powder sugar, vanilla, remaining cinnamon and whipping cream. Beat buttercream for 5-7 minutes are until light and fluffy. Store any leftover in the refrigerator or freezer. Ok, you caught me - I'm excited and counting the weeks until it's fall. I love watching the leaves turn and finding gorgeous orange pumpkins at the market. Pecan pie is a favorite autumn dessert, but I think with the ease of the recipe that you will be enjoying the taste all year! Absolutely delicious! The page, outlook, content and pictures are all very tasteful, literally speaking! Just reading the title is enough to make your mouth flood, and the pictures simply make you thrive for the treat. Splendid job! It is always the right time to have some cookies! Especially if they look as tempting as these bourbon cadied pecan pie cookies that you made!